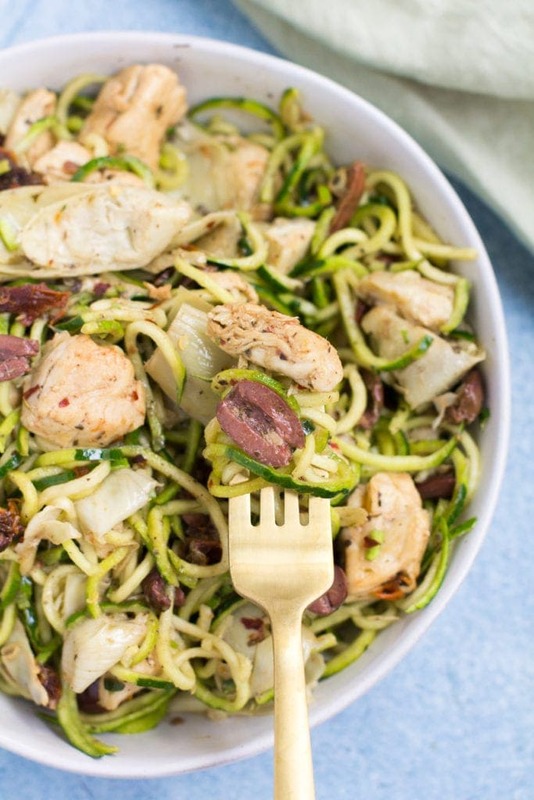 Whole30 Greek Chicken Zucchini Noodles are an easy, healthy weeknight dinner. Made with only 10 ingredients, gluten free, paleo, low carb + so delicious! 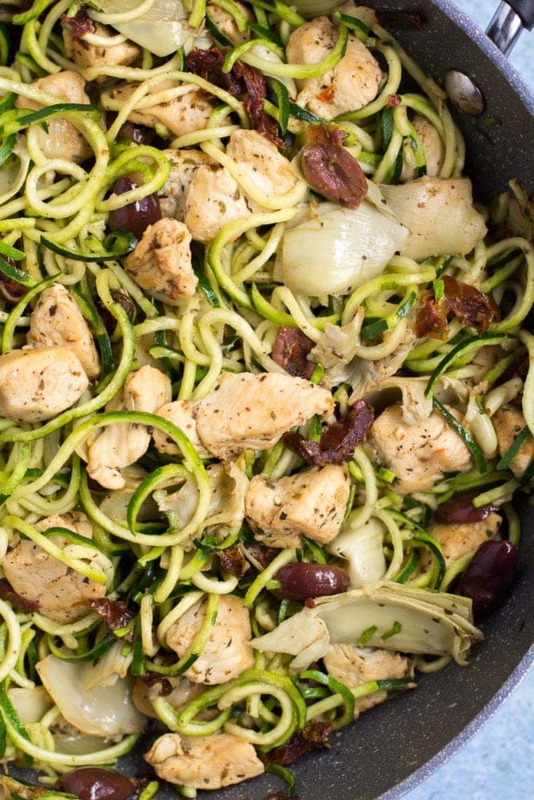 If you like easy dinners – you are going to LOVE this Whole30 Greek Chicken Zucchini Noodles Recipe. It’s made with only 10 ingredients, is packed with flavor, and is done in under 30 minutes. Talk about a dream dinner! This is a great quick meal to throw together on a busy weeknight, or if you’re looking for a lightened up version of a traditional pasta dish. 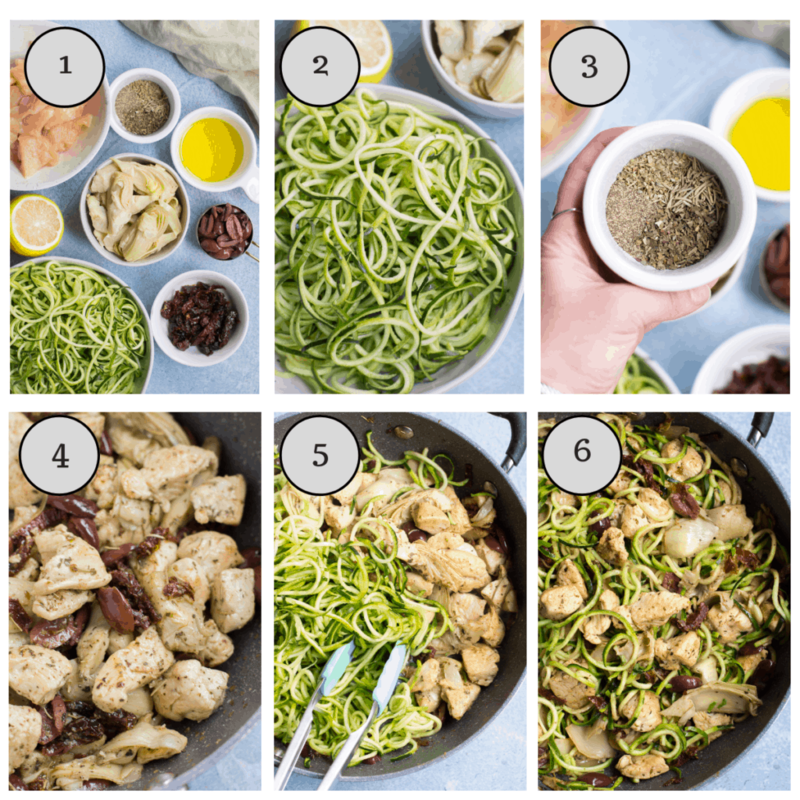 After making these Whole30 Pesto Chicken Zucchini Noodles all summer long, I knew I would need a more fall/wintery version of zoodles to have on the menu rotation. Since produce isn’t as great where we live in the colder months, I opted to use jarred olives, tomatoes and artichokes in the dish. We always somehow seem to have a half open jar of olives, sun dried tomatoes and artichoke hearts laying around in our fridge, so I tossed them together with a few other ingredients and the result was epic! Making this healthy dinner isn’t difficult at all. You’ll need some pantry staples as well as basic ingredients like oregano, thyme, kalamata olives, sun dried tomatoes, and artichoke hearts. 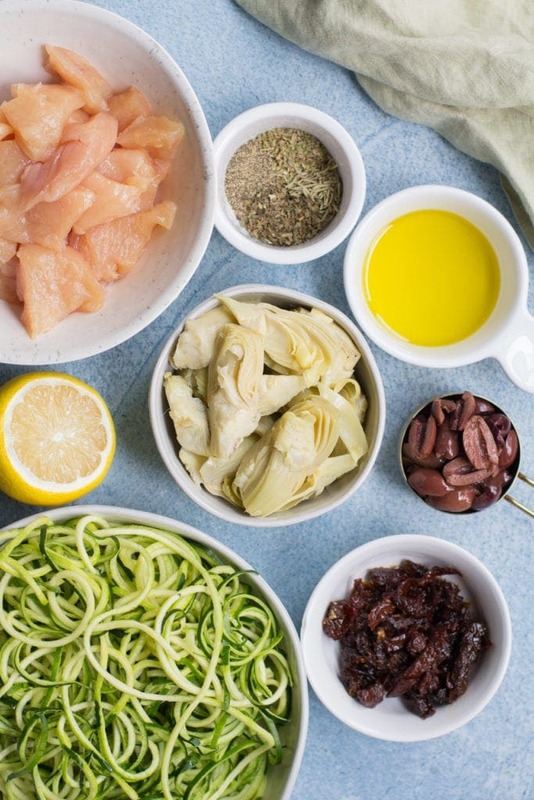 You’ll also need a spiralizer to make zucchini noodles. Once all your ingredients are set up, it’s just a matter of browning your chicken, and stirring in the spices, olives, sun dried tomatoes/artichoke hearts until combined. Then you toss the zucchini noodles in + dinner is done! 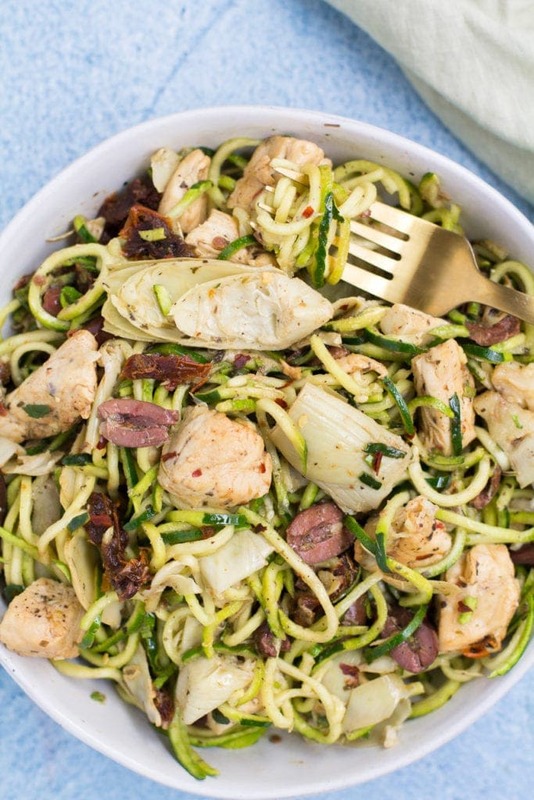 Zucchini noodles are one of my favorite things to use in recipes for a few reasons. They’re an awesome alternative to regular pasta. I also love that they don’t leave me feeling super full, or in a ‘carb coma’. Believe me, I love the real-deal, gluten filled, home made pasta… but feeling like you’re going to fall asleep after eating it is the worst! 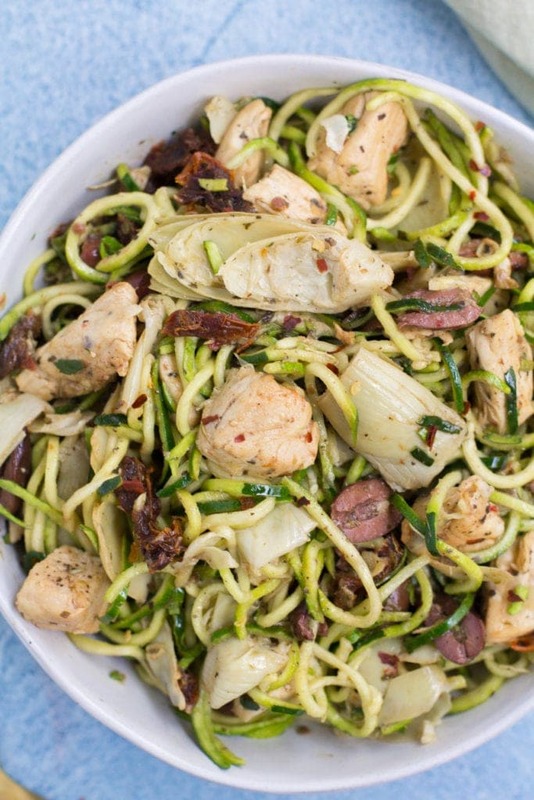 Another great thing about zucchini noodles? They take on the flavor of whatever you’re cooking with. So when you pair them with sun dried tomatoes, kalamata olives, and artichoke hearts.. you know it’s going to be good! The best part about this dish is that it is paleo, gluten free, grain free, and dairy free – but it really doesn’t even taste like it. 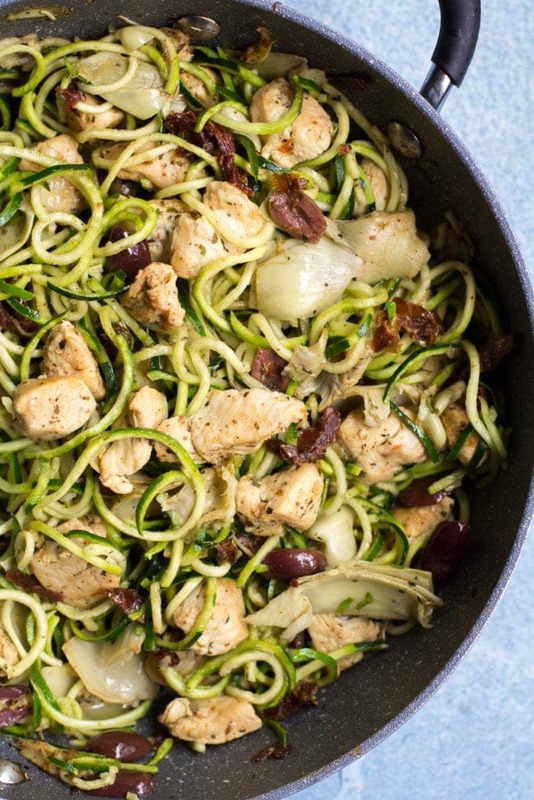 The zucchini noodles make it seem like a big fancy pasta dish, but in reality – it’s super healthy! This would be great for serving for a fun date night.. but I can also verify that it is great when eaten in front of a TV while wearing sweatpants (speaking from experience). Can I use pasta instead? Sure, you can use pasta instead of zucchini noodles in this recipe. It will however, not be whole30. For a paleo pasta I like Trader Joe’s Cauliflower Gnocchi or Capello’s fettuccine and will sometimes even add them into this dish for extra volume/carbs. For gluten free pasta I like Modern Table Meals. You can also do half pasta and half zucchini noodles. I would just cook the pasta while the chicken is cooking and toss in when you would toss in zucchini noodles. I commonly get asked how to avoid watery zucchini noodles. 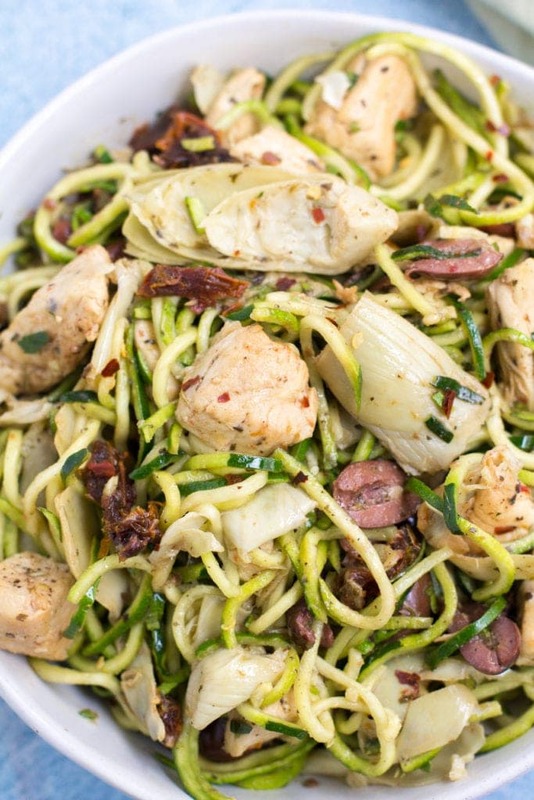 I have two tips for you for how to avoid soggy zucchini noodles. REALLY squeeze the water out of them- I use a thick, absorbent (and clean!) dish towel and squeeze the water out of the noodles hard. The towel should be damp when done. I then lay the zucchini noodles out on a paper towel lined baking sheet until I’m ready to use them. Don’t add in the zucchini noodles to the dish until you are ready to serve. 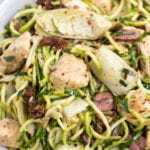 – If you’re meal prepping, you can place the chicken/veggie mixture into a container and place your raw zucchini noodles on top. When you’re ready to eat, microwave or heat over the stove to avoid mushy noodles. 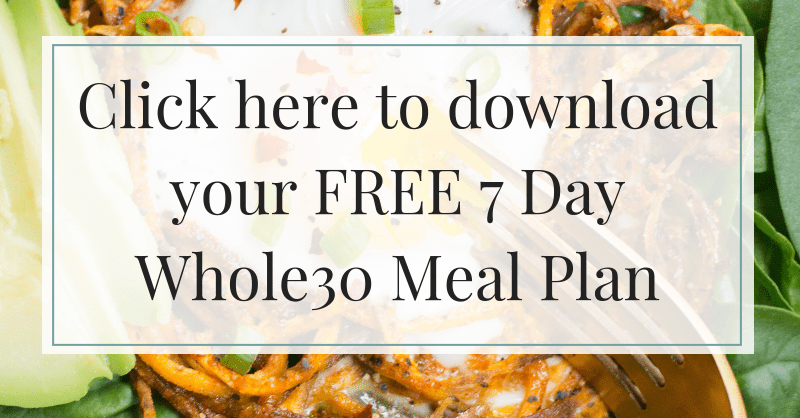 Need other Whole30 dinner ideas? Try these recipes. We made these for dinner tonight and OMG YUM! Definitely will be making them again! So glad to hear this, Katie!! It definitely is super easy to make and so yummy! This is a delicious and quick meal we make every week. The directions are so simple and it’s a great way to get veggies in my family. It makes great left overs. Just made this recipe and it was so easy and yummy! All of the ingredients were easy to find at Trader Joes. This will definitely be a favorite repeat recipe!